I made this tiny mod dependant on the Skyrim_data of course. I plan to release it as a side mod when our next release is out. 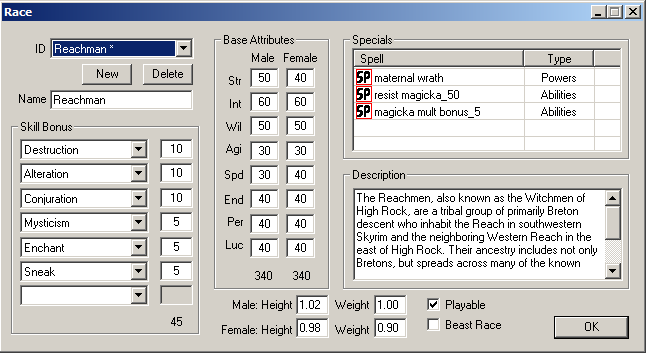 I had ideas for other powers; Visage of Trinimac (fortify strength, weakness to magicka for 60 secs), Elven Blood (regenerate magicka, fortify magicka) - feel free to comment and come with critique; for instance i set the base attributes 30 pts too high, but I fixed that in the file below. Looks nice roerich. I still wonder whether we should have made the Reachmen a separate race in SHotN itself. It might have made filtering dialogue to them more straightforward. One priority we should really look into is recording idle spoken dialogue for them, so they don't use the ill-fitting Breton voice. Can't try it now. You got any screens of the reachmen? Yeti wrote: Looks nice roerich. I still wonder whether we should have made the Reachmen a separate race in SHotN itself. It might have made filtering dialogue to them more straightforward. One priority we should really look into is recording idle spoken dialogue for them, so they don't use the ill-fitting Breton voice. I don't see any good reason to not make them a seperate race. Spoken dialogue would be interesting..
- The 1st pg already says that the Breton race encompasses a range of different people of varying heritage that are only called Bretons for convenience sake, a bit similar to how the imperial race encompasses Akaviri descendants and other branch-offs. And the Reachmen still fit into the overall categorisation of the Highrock people, being halfmer, like the western Breton people and having a strong magical affinity. Of course, they don't think of themselves as Bretons, but the Bjoulsae Tribes will probably be the same there. You could still consider them all Bretons. - Not having to deal with the question of better bodies or not. A minor point, but still a point that stands. If you are so much for using them as separate race, I would make sure to look over the attributes once more. The ones above don't quite make sense. Strength 50? Intelligence 60 (smarter than altmer)? Agility 30? How have they managed to bring forth talented assassins at all? Why not give them a low personality (30), fitting their role in society? Edit: Forgive me the pissy tone. I have had a bad day. Having them as a seperate race would make more sense for game mechanics rather than lore, although I do think of them as being remarkably different from other Bretonnic subgroups; "The Reachmen are a mongrel breed, even for Bretons. [...] but Elven blood still flows strong in the Reachmen" (1st PGE) and also since they occupy a pretty large region and have a history of independency claims. In the context of our mod being set in the Reach, it makes sense to make them distinct, if you ask me - we're not going to showcase a great number of Bjoulsae horsemen for instance, but we have time and place to flesh out the Reachman culture. The attributes weren't carefully researched, and should definetly need more work. Thanks for correcting me, I was just messing around. The Reachmen actually do have assassins, although I can't remember the source right now. A reachman assassin killed a Breton king at least. I was more trying to show them as men who knew the land in this setting. I thought I lowered their personality, but I must've forgotten that one - I was thinking the same as you. I will revise the attributes. This is still just intended as a personal mod because I want to play as a Reachman, SHOTN should be more thorough if we decide to add them. And no problem Worsas, you're entitled to your opinion just like everyone else here, and I could definitely use some feedback which was why I posted this here. Truthfully, I don't really mind either way. Your points certainly make a lot of sense, Worsas.